What does #GIVINGTUESDAY mean to Canary? Black Friday. Cyber Monday. What do these shopping events have to do with giving thanks? Traditionally, Thanksgiving has been a time for reflection; a time to refocus on what it means to be thankful. #GivingTuesday was the answer to the question: How do we get back to the root of what it means to give thanks. Now in its fourth year, #GivingTuesday is a collaborative, social media inspired day of giving, fueled by those who want to make a difference. Nonprofits have the opportunity to tap into a network of social activists and promote a variety of local and national causes. So where does the Canary Foundation factor in? For us, #GivingTuesday is more than just giving back. #GivingTuesday is a time for us to reflect and remember those who have struggled with cancer. #GivingTuesday is an opportunity to thank our scientists who constantly push themselves to find innovative methods of detecting cancer at its earliest stage. #GivingTuesday is a moment to pause and think about all the work that the Canary Foundation has been able to achieve over the past 10 years and to be thankful that we have the ability to continue achieving the improbable. On this #GivingTuesday, we thank you for your belief in our mission and ask that keep us in mind as you make your year-end decisions about giving. The 5th annual Canary Challenge cycling fundraiser was held on September 26th, 2015 out of HP Headquarters in Palo Alto. As of mid-October, participants in the Canary Challenge have raised $1,155,317 towards early cancer detection research. 100% of the proceeds from the cycling fundraiser will go towards the Canary Foundation and the research that it funds. Since it’s inaugural year in 2011, the Canary Challenge has seen tremendous growth in the number of participants, teams, and fundraising. In 2015, over 1,000 participants, 101 teams, and almost 200 volunteers came together to raise over $1 million for early cancer detection research. With each individual rider raising an average of over $1,000, more than double the $400 participation minimum, the passion that participants have for finding cancer at its earliest, must curable stage, is truly inspiring. Special thanks and recognition to the businesses and individuals who donated their time and goods to making the post-ride Village a success! Pro riders included Eamon Lucas, Freddie Rodriquez, and Liza Rachetto. Corporate Team Sponsorships this year included, Agilent Technology, Avaya, Netsuite, VMware, SAP and Juniper Networks. A last and final thank you to the Menlo Bike Club, who fearlessly led training rides to prepare riders of all levels for the Canary Challenge routes and provided countless opportunities to learn from experienced riders such as Menlo Bike Club Leader Hani Juha. Special recognition for Maren Deem – a 12-year old cycling-enthusiast, whose mother is currently battling breast cancer, single-handedly raised $33K for early cancer detection. At the Canary Foundation, we believe that there is something intrinsically rewarding in devoting time to a cause that is bigger than one individual person. That is why it is an honor to call this kind of work a living, and a privilege to work alongside some of the brightest minds in science and non-profit work. Time and time again we see this same passion from the people who make the Canary Challenge possible: our volunteers. Each year we see an average of 200 volunteers arrive at the Canary Challenge Bike Ride, ready to roll up their sleeves and get their hands dirty for a great cause. For some, this will be their first year volunteering. For others, volunteering runs in their blood. Meet Nels “Pete” Pearson. A former director with the Santa Clara County Peace Officers Association, Pete has always been passionate about giving back to his community. Prior to his time in Santa Clara, Pete volunteered throughout the county of Santa Cruz working with various non-profits in his community. Pete’s commitment to giving back is something he claims is in his DNA, but like many things we can blame genetics for, cancer was also lurking in Pete’s family history. Pete’s father passed away from pancreatic cancer at the age of 54, leaving a 15 year-old Pete with a jumble of questions. Further down the road, Pete’s mother would also succumb to the disease at the age of 84. So when Pete himself was diagnosed with aggressive prostate cancer at the age of 53, it was his family history with cancer that was predominantly on his mind. For a person who had dedicated much of his time making sure others were safe and cared for, Pete’s diagnosis left him feeling vulnerable and alone. Surgery and chemotherapy quickly followed upon Pete’s diagnosis to combat the cells that were attacking his body. At first, Pete’s remission had an optimistic outlook, but to Pete’s dismay, the cancer kept creeping back. Pete chose to undergo chemotherapy again for eight months to try and re-attack the cancer, which sparked a reaction causing random episodes of fainting. It was like clockwork, Pete recalls. Chemo finished by Wednesday, fainting and couch-ridden by Friday. A month after his last chemo treatment when he and his wife were on a plane headed towards Cancun, Mexico, Pete reached a turning point. Instead of landing in Cancun, they had landed in Lubbock, Texas; Pete had fainted mid flight causing an emergency landing halfway to Cancun. At that point, Pete made a choice to undergo radiation treatments. 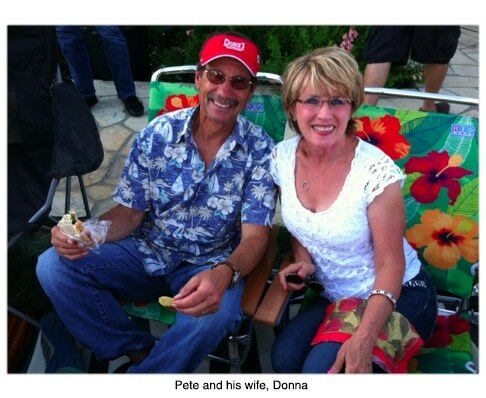 To Pete’s relief, treatment continued without a single side affect and he returned his attention to giving back. Naturally, Pete sought out a cancer foundation to volunteer for where he believed he could make the biggest impact, disrupting and changing the fate of today’s cancer statistics. What he found was the Canary Foundation. It’s people like Pete who embody the spirit of the Canary Foundation. 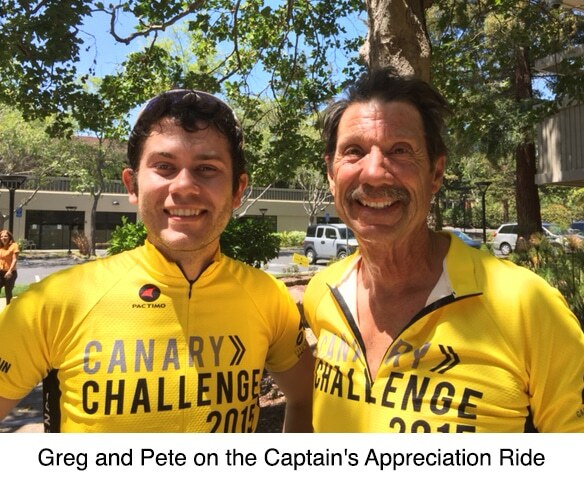 Pete is a leader among our group of passionate volunteers who dedicate their time and considerable talents to making the Canary Challenge and ultimately the Canary Foundation a change agent in the scientific community. The Canary Foundation is absolutely thrilled to be a beneficiary featured in the Get health + Give health initiative, from local Palo Alto start-up, HealthTap. HealthTap is the world’slargest, most trusted digital health hub providing 24/7 immediate access to personalized, high-quality information and virtual medical care from 71,000 U.S. doctors. “Get health + Give health” is HealthTap’s newest initiative, letting anyone who purchases a virtual consultation to select a charity to receive a virtual consult for free. The HealthTap virtual consult is a window into clinical screenings that can provide a patient with preventative resources that were previously unattainable. Early detection and preventative care makes up the core of what we do, and HealthTap is providing a new outlet to further this objective. The fight against cancer is not a soloist’s battle. Our partnership and collaboration with HealthTap is an exciting honor that will propel our fundamental goals into the coming months ahead. 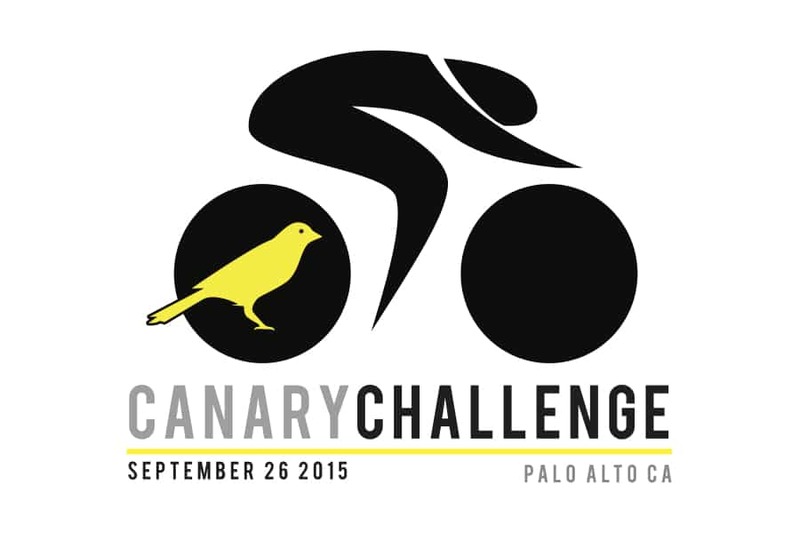 The Canary Foundation visits dozens of cycling events around the Bay Area yearlong. We’re hard to miss with our big yellow tent, eye-catching posters, and stylish staff (What can I say? We look good in polos!). 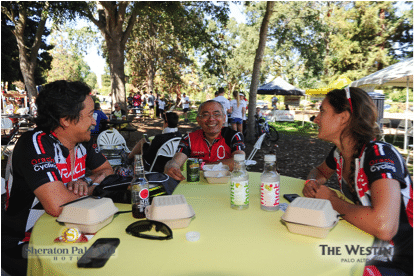 On Sunday, May 3rd, our big yellow tent was stationed at the 1st annual Silicon Valley Bike Festival at History Park in San Jose, CA. It was a glorious day filled with bikes, entertainment, vendors, and most importantly, awesome people! As the crowds pedaled their way around the various booths and vendors, one woman in particular found the Canary Foundation’s booth to be an awe-inspiring kick-starter of cycling passion. On this sunny afternoon in San Jose, the Canary Team got to meet Amanda Lowrey. It turns out that Amanda didn’t own a bike. Her husband was a hard-core cyclist, and her friends all liked to ride, but here she was, bike-less, at an all-day festival solely promoting the greatness of two-wheeled bipedal locomotion. Things were about to change for her, however. Amanda spotted our yellow tent with two stylishly polo’d Canary employees under it, and wondered what the heck our spiel was all about. Canary Foundation employees, Greg and Lara, graciously got to speak with Amanda, telling her all about early detection cancer research, the Canary Center at Stanford, and last but not least: The Canary Challenge 2015. Amanda left our tent with a Canary bag full of sunscreen, a pamphlet, and a coupon code, but little did we realize, she also left our booth with a newfound passion and surge of cycling inspiration! Later that night, Amanda reflected upon all the people in her life that had been affected by cancer: her father, her grandfather, and various numbers of friend’s parents who had passed away from the disease. She thought to herself how absurd the lack of research in early detection and preventative action was, and how the structure of funding was disproportionality skewed. The thought rang so true in her mind that she decided to do what any sane person without a bicycle would do: sign up for a 75-mile cycling challenge! The old proverb of “crawling before you walk” decided to defenestrate itself altogether; Amanda was now team captain for an activity she had done less than a handful of times. This new cycling venture was not approached on a blind curve, however. Checking out Amanda’s background would show she was one to reckon with in lower body strength. Amanda started dancing at the age of 6, and by college, she had mastered ballet, modern jazz, swing, afro-Cuban modern, and salsa. Currently, she dances with a company called Salsamania based out of Oakland, CA. Saying she knows how to move her feet well would be the understatement of the century, which brings us right back to the main attraction: the bike. 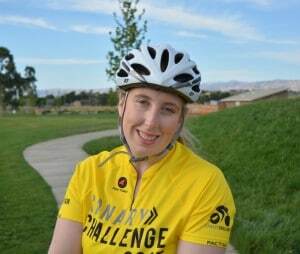 Amanda went to her local bike shop and purchased herself her first road bike and clipless pedals soon after signing herself up for the Canary Challenge. Her first ride on the trail went without a hitch, and at a respectable 25 miles, she was showing her new bike how to tango! Her next few rides, however, were more trial by fire. In her honest words, Amanda didn’t know what gears were, nonetheless how or when to shift them. She had to learn the proper mechanics the hard way up Mt. Eden when she toppled over, stuck in the highest gear. The good news was that she didn’t make that mistake twice! Since that minor hiccup, Amanda has been enjoying the time spent with her husband, and her avid cycling friends, all the while training and raising money for a great cause in the process. On June 13th, Amanda joined us on our Captain’s Appreciation Ride, where we went for a total of 30 miles from the Canary Center, up Mt Eden, and back. Amanda felt completely comfortable at our pace while she tackled Mt. Eden once more, this time shifting gracefully without a single tumble. 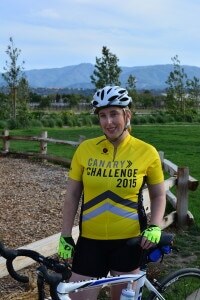 Two months out from the Canary Challenge 2015, and Amanda is making some serious headway in her training log. In just a few weeks Amanda has gone from newbie to weekend warrior, putting in 30-mile rides or more, every weekend with her team. Amanda plans on upping her game week by week to get her fully in shape for those hilly climbs on the 75-mile course. At her pace, she should have nothing to worry about! On the fundraising side of things, Amanda has passed the minimum donation, and is almost halfway to her ultimate goal of $1000. She has even branched off and started helping her teammates out with networking and donations to make sure that everyone is on track. In just a few months, Amanda has truly earned her stripes as Team Captain, as well as earned her badge as a hard-core cyclist. Amanda’s story goes to show that even the most novice participants can accomplish wonders with a determined mindset. As a non-profit working on innovating early detection diagnostics for 10 years, we here at the Canary Foundation can truly relate to Amanda’s spirit. Canary knows there is a finish line in sight, but until we get there, we will just have to enjoy seeing Amanda cross hers on September 26th. From all of us here at the Canary Foundation, keep at it, Amanda! Jim Olwell knows a thing or two about pacing yourself. He might not be the racingtype, or even a weekend warrior per se, but Jim’s cycling credentials would leave other carbon-fibered newbies in the dust. For starters, Jim has biked to work for the past 17 years of his 34-year teaching career at De La Salle High School; putting in a mind-boggling number of miles, one can only imagine. Jim has also toured up and down the Pacific Coast on multiple occasions too – going his own pace no less – which means more time to soak in the view! Even in his college days you could have seen Jim riding to class or throughout downtown Davis: one of the nation’s friendliest cycling communities. Jim’s relationship with his bike was a match made in cycling heaven, but what the road didn’t foresee, however, was Jim’s diagnosis of prostate cancer in 2007; a diagnosis that would bring Jim’s cycling days to a brake-screeching halt. In July of 2008, after Jim’s rehabilitation, Jim and his wife, Wendy, went to cheer on their beloved friend, Steve Dakin, at a cancer charity ride in San Jose. This inspiring day would soon pave the way for Jim’s cycling rebound, as well as mentally prepare himself for the bumpy road ahead. Remission can be a time for unfathomable gratitude, yet staggering uncertainty. Five years had passed since Jim Olwell’s last treatment, and Jim was back to his healthy self again. 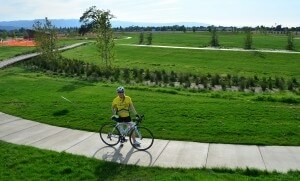 Like a cycling crusade, Jim was armed with a newfound cause inspiring him to sign up for multiple cancer charity rides throughout Davis and San Jose. Steve Dakin joined Jim in his effort and formed team “Spartan” after De La Salle’s mascot. It was April of 2014 when Jim signed up for his first Canary Challenge bike ride with his wife, Wendy, fellow friend, Steve, and several other friends from Steve’s work. Training for this was smooth sailing until summer rolled around, and Jim’s pace dramatically shifted. Molehills became lung crushers, and long climbs were completely out of the question. Jim knew there was something wrong. In September, Jim went to his doctor to run several blood tests. For two days, Jim had a nosebleed that just wouldn’t quit. Jim’s wife, who is also a nurse, finally convinced Jim to head to the ER where more tests were given. It was Jim’s 56th birthday, September 18th 2014, when Jim found out his cancer remission took a huge backpedal; Jim was now battling against chronic lymphocytic leukemia and multiple myeloma. Hopes of completing the 100-mile Canary Challenge Century had dwindled down to a wavering 5k walk. On top of this, Jim’s nurse notified him that his blood transfusion would be set to go the morning of the 27th – the day of the Canary Challenge. Jim’s family was determined to get him on his bike one way or another. When the nurse gave the news about Jim’s blood transfusion, Wendy took the nurse aside and worked her magic to advance the transfusion to Friday the 26th instead; singlehandedly saving the day that Jim was training for all year. This was thrilling news to hear, even in Jim’s uncertain condition. 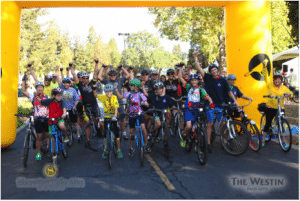 On the morning of the Canary Challenge, Jim was shocked when he was presented with yellow “Team Jim” t-shirts, and a tandem bike from a Los Altos bike shop: a collaborative and loving scheme from Wendy and Steve to secure Jim’s wish to ride the Challenge. The generous gesture brought Jim to tears. When the Canary Challenge began, Steve took the backend of the tandem for the ride, becoming Jim’s workhorse for the whole day. Even Wendy, who would typically never be one to ride for enjoyment, rode along side Jim and Steve in support of her husband. When the three of them crossed the finish line, the Canary team was there to congratulate Jim, and ask him why he rides. Jim’s emotions left him speechless, with nothing but tears flowing from his cheek. To us, that was the best answer we could have gotten. “There are many great rides benefitting many great causes. As long as I can ride, I will find a ride that benefits cancer research. I will ride the Canary as long as I can balance on a bike. I do hope to be able to complete the 100-mile someday (though the 8000+ feet of climbing is daunting), though I would rather ride – and finish – with my friends and wife. Then enjoy a meal and beer with them!!”. We hope so, too, Jim. We hope so, too. In light of recent controversy surrounding the distribution of funding for a handful of cancer foundations, we at the Canary Foundation feel compelled to reiterate our responsibility and foundational credo. The Canary Foundation was founded with one ultimate goal in mind: to establish safer, more accurate, and more cost effective ways of diagnosing cancer early. This objective purpose is what wakes us up in the morning, roasts our coffee, rolls up our sleeves, and puts our heads down to work. We are a small team of dedicated people with the spirit of a scrappy startup, but the prowess of non-profit industry veterans. We empathize, first hand, with the tragedies of cancer, as well as with the fortitude that comes from overcoming it. We know that every dollar, dime, and nickel we receive was raised by hard-working individuals who put in good faith that their financial efforts are going towards a cause that is bigger than themselves. We believe that as an established cancer foundation, it is not what we say, but what we do that should earn the hope and trust of the community. We recognize and acknowledge this, praise and honor it. That is why we strive towards earning your respect by accomplishing our goals in the most responsible ways possible. Since our inception in 2004, the Canary Foundation has been dedicated to a policy of honest transparency. Each year we publish an independently audited report of our financial records to illustrate exactly what our donations are funding: scientific research. And if you ask us, the science doesn’t lie. Cancer mortality rates have declined in the past 20 years with only 5% of invested dollars going towards early cancer detection. Imagine what a bigger investment could do? That’s where we come in. 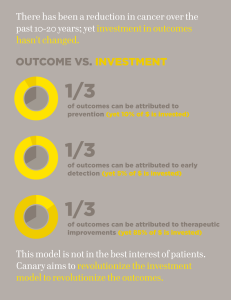 The Canary Foundation is disrupting the current model of dollars invested to revolutionize the outcomes and save lives. We can’t take credit for this alone, however. With our partnerships and collaborations with Stanford Medicine and the Canary Center at Stanford, we have developed new imaging technology and biomarker identification methods which have enabled science to peer into cells, tissue, and tumors in ways never before possible. Canary funds small, short-term discovery projects for new ideas and technologies, and uses pilot data to gain an edge with government grants. Additionally, Canary funds larger, multi-disciplinary teams and clinical programs covering tumors across five cancer types: breast, lung, ovarian, pancreas, and prostate. With the ultimate goal of bringing new innovative diagnostics to patients, we are proud to say that this has already begun in high-risk clinics nationally. funds raised by participants gets distributed among our programs at the Canary Center at Stanford. That’s right: 100%. We underwrite the majority of our operations costs through sponsorships, volunteers and the Founder’s Fund to ensure that every penny is being used for early detection research. Fraudulent cancer foundations break our hearts as much as anyone else’s, but it is perseverance through adversity that defines us at Canary, which is what prides us in the work we have accomplished thus far. Although we have many steps to take towards our fundamental goal, it is an optimistic vision no less, that fuels our mission along the way. To all of our donors, volunteers, scientists, readers, and supporters, thank you, and best wishes as we continue with our work moving forward. Here at the Canary Foundation, one could say that we have an inherent fondness towards birds. 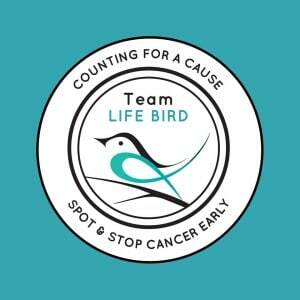 So when Diana Handy approached us with an idea to put on an all-day bird watch to raise money for early detection cancer research, it certainly didn’t ruffle our feathers. Diana Handy grew up loving animals. This she attributes to her mother who raised Diana on a healthy dose of nature and the outdoors. When Diana was a young girl, she used to gaze upon the bird feeder, nestled in the magnolia tree of her front yard, with an awe-inspiring curiosity of the birds that perched upon it. It was there that Diana’s mother helped Diana identify birds for the first time; thus nurturing Diana into the nature loving, bird watching enthusiast she is today! With much gratitude, Canary Foundation is proud to announce that we have been selected as the beneficiary of net proceeds for a new book being released. 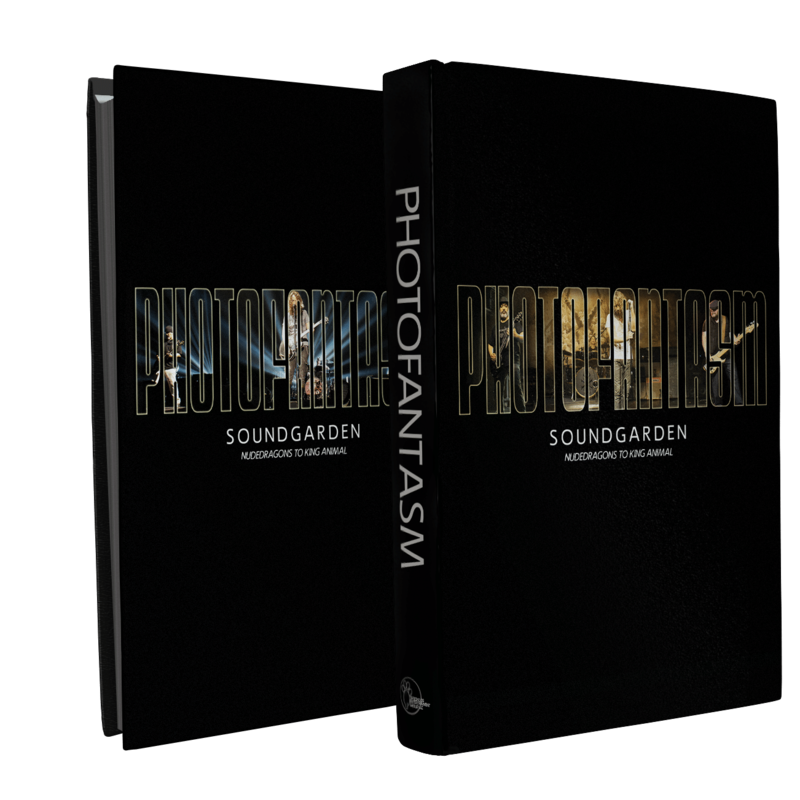 Photofantasm Soundgarden: Nudedragons to King Animal highlights the rebirth of the Seattle based band, Soundgarden, via hundreds of pages’ worth of photographs, graphic art, anecdotes, interviews, and reviews. 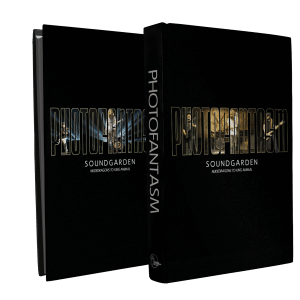 The heart of this book is a section devoted to the loving memory of an extraordinary friend and Soundgarden fan who courageously fought cancer.